Cash Nickerson - Talent Acquisition Solutions | PDS Tech Continue reading "Cash Nickerson"
Steven “Cash” Nickerson is President and a Principal of PDS Tech, Inc., a position he has held since 2003. With approximately $300 million in annual sales, PDS is one of the largest staffing firms in the United States, employing more than 10,000 staffers annually. 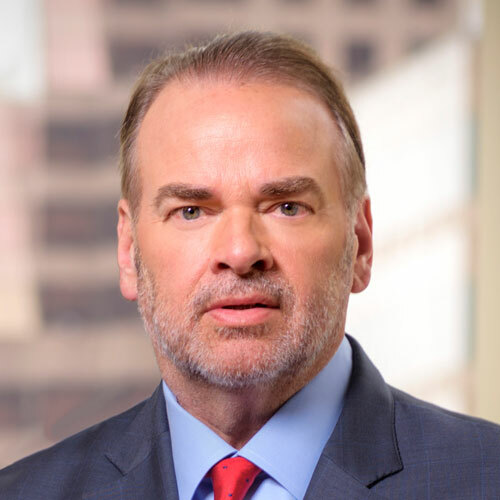 He has held a variety of legal and executive positions in his 30-year career, including serving as an attorney and marketing executive for Union Pacific Railroad, an associate and then partner at Jenner & Block, one of Chicago’s five largest law firms and chairman, and CEO of an Internet company he took public through a reverse merger. Mr. Nickerson holds a JD and MBA from Washington University in St. Louis, where he was an editor of the law review and a recipient of the US Steel Scholarship. He is a member of the National Council of the Washington University in St. Louis School of Law and International Council of the Whitney R. Harris World Law Institute. Mr. Nickerson serves on the Equifax Workforce Solutions Client Advisory Board and was Keynote speaker at the Equifax 2013 Client Forum. Mr. Nickerson was honored with the Distinguished Alumni Award in 2013 by Washington University in St. Louis School of Law and a Founders Day Distinguished Alumni Award from Washington University in St. Louis in 2014. He received the Global Philanthropy Award in 2010 from Washington University in St. Louis for his support of the Crimes Against Humanity Initiative. Mr. Nickerson was elected the Ethan A. H. Shepley Trustee at Washington University in St. Louis on December 5, 2014 for a four-year term. An avid writer and speaker on the workplace, the jobs economy and employment, Mr. Nickerson is the author of BOOMERangs: Engaging the Aging Workforce in America (2014), StagNation: Understanding the New Normal in Employment (2013), Getting to Next: Lessons to Help Take Your Career to The Next Level (2015), and Listening as a Martial Art: Master Your Listening Skills for Success (2015). He also writes travel books, including A Texan in Tuscany (2013).